Did you know that your pet can suffer from seasonal allergies the same as what you do? Over half of pets can be can be just as miserable as their owners in the spring and summer months with season allergies. Most owners aren’t even aware of what’s going on. There are typically two types of allergies in our pets. Food allergies and environmental allergies. 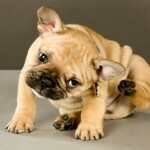 If your pet gets itchy during the spring, summer or fall, then it’s probably seasonal allergens. If it’s a year-round thing, then it’s more than likely something in the diet. Allergies in dogs and cats usually are in the form of a skin irritation – which is called allergic dermatitis. If your pet does have allergies, her skin will become itchy. She will probably begin scratching excessively, and may even bite and chew at herself. She may even develop open sores, hair loss or scabbing, or what is called Hot Spots. Pets with allergies also often have problems with their ears – especially dogs. The ear canals may be itchy and inflamed. Signs your pet’s ears are giving her problems include scratching at the ears, head shaking, and hair loss around the ears. Typically pets with seasonal allergies to ragweed, grasses, pollens, molds and trees, also develop sensitivity to other allergens inhaled through the nose and mouth. Animals with weaknesses in their lung fields can develop sinusitis and bronchitis, just as people do. Another sign to watch for if you suspect your pet has allergies is generalized redness. Allergic pets often have puffy red eyes, red oral tissue, a red chin or red paws. Two steps in managing her condition are regular foot soaks and baths during the warmer months when all those triggers are in bloom. Dermatologists recommend this approach for human allergy sufferers. Your doctor will tell you to shower at night and in the morning to remove allergens from the surface of your body. Do the same for your dog or cat. Makes sense. Frequent baths give immediate relief to an itchy pet and wash away the allergens on the coat and skin. Make sure to use a grain free (oatmeal free) shampoo. Quercetin. Quercetin is a bioflavonoid with anti-inflammatory and antioxidant properties. It’s called ‘nature’s Benadryl’ because it does a great job suppressing histamine release from mast cells and basophiles. Histamine is what causes much of the inflammation, redness and irritation characteristic of an allergic response. By turning off histamine production with a quercetin supplement, you can suppress or at least moderate the effects of inflammation. One of the reasons to use quercetin, bromelain and papain together is they also suppress prostaglandin release. Prostaglandins are another pathway by which inflammation can occur. By suppressing prostaglandins, we can decrease the pain and inflammation associated with irritated mucous membranes and body parts. Using the three substances in combination provides some natural pain and inflammation control. Coconut oil. Also recommended is coconut oil for allergic pets. Coconut oil contains lauric acid, which helps decrease the production of yeast. Using a fish body oil with coconut oil before inflammation flares up in your pet’s body can help moderate or even suppress the inflammatory response. There are many things you as a pet owner can do to help diminish the effects of your pet’s allergic condition, these are just a few.